Special breakfast. Box of chocolates. Cute card. Lavish surf and turf dinner. This was every Valentine’s Day in my mama’s house. Although it was my parents’ home, holidays belonged exclusively to Mama Chin. My mom decorated (and still does) for every holiday. Coordinating festive table linens, appropriate lighting, and music when applicable. No holiday complete without a special meal, and she’s get creative with things from her homey Minnesotan Betty Crocker mental stash or Food Network magazine. Before Pinterest, food influencers, and mommy bloggers alike, there were just really crafty moms doin’ their thing. So while Valentines Day is a holiday where people think of their significant other, I’ll always think of my mom, who managed (and still manages) to make every holiday even more special than the previous. Food is a gift, an act of kindness, and a love note all in one, and my hope is that I can make holidays special with food as my mom did with me. If you’ve made it past the first two paragraphs without needing a Kleenex like I did, congrats. You’ve moved on to recipe talk. This recipe is an amped up, gourmand’s version of fondue and chocolates. Cocoa-chili-rubbed filet mignons that are toasty and tender, fondue cheese scalloped sweet potatoes that are moist and savory. If you can look past the simplicity that is classic “steak and potatoes” you’ll see the beauty in this meal, and you’ll find yourself wishing you’d reserved the two servings for you and you alone. Pat the steaks dry and rub them with the salt, chili powder, and cocoa powder on all sides. Cover and refrigerate for 30 minutes. Take the steaks out about 15 minutes before they’re ready to cook so they get closer to room temperature. Heat a cast iron skillet to medium-high and in it, melt the butter. 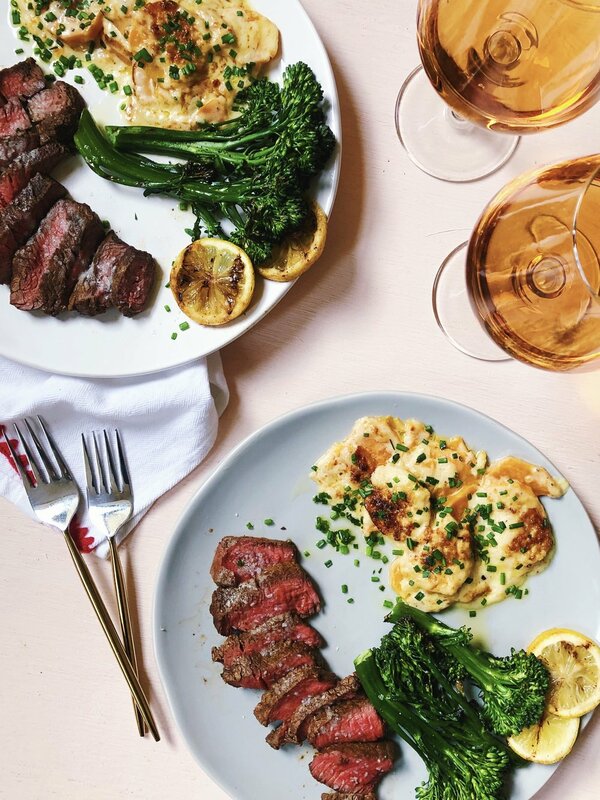 Once the butter is melted and on the verge of sizzling, place the steaks down into the skillet and cook for 4 minutes, constantly basting with the pan butter. Flip the steaks to the other side and baste again, adding pepper to your crust and salt as desired. After steaks have cooked for about 4 minutes each side (or more if you’d like them more well-done than medium-rare), remove them from heat and on to a cutting board to rest. Serve after about 7-10 minutes of resting. Peel and thinly slice the sweet potatoes so that they’re just thick enough to not be see-through. Add the heavy cream and broth, then incorporate the garlic, nutmeg, mustard, and black pepper. Bring to a rolling boil. Once boiling, whisk in the flour and turn the heat down to low, whisking until you have a thick, gravy-like consistency. Grease a small baking dish with neutral oil with butter, and layer potatoes and cheese sauce on top of each other until the potatoes are covered. Your potatoes should have a nice bubbly-brown crust on them. Serve hot! Carefully add a little more oil to the pan and the broccolini, and char for 3 minutes on each side. Salt to taste. Serve immediately with the charred lemons.